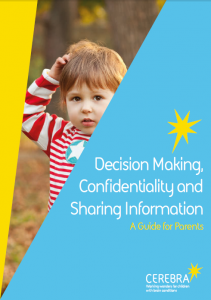 This guide has been prepared for parents of disabled children and young people to provide an overview of the law and policy relevant to decision-making in health and social care, including the duty of confidentiality and sharing information. This is an important area because parents are likely to find that their role in decision-making about their child’s care and support changes as they get older. Health and social care professionals will start to encourage disabled children and young people to take an active part in planning and reviewing their own care and support. Parents who have been closely involved in their child’s health and social care, might find this change of approach difficult, especially if the reasons for their reduced involvement are not explained to them. Accordingly, this guide covers the main areas relating to decision-making through a series of questions and answers. You can download the guide and a useful flowchart (‘Who Makes Decisions About My Child’s Care?’), below. Download Flowchart: Who Makes Decisions About My Child's Care?